A space shuttle carrying toxic waste collides with a meteor causing a toxic storm over the Atlantic seaboard. Virulent rain pours down, infecting everyone that it touches. The people caught in the rainstorm begin to decompose, but their minds are kept intact. Everyone is scared, so the town decides to quarantine the infected on the beach. The “beachers” hold a grudge on the “norms,” so they plan their revenge accordingly. It is funny, gross, and at times really sad. To be honest, I didn’t know who to feel sorry for. This is a very different type of zombie story. I mean that in a good way. The zombies in this book are different because they don’t eat brains or people. The “beachers” like hurting and torturing the “norms.” The “beachers” decay just like typical zombies, though. These zombies have mutated! They have gained special powers, which is kind of cool! The author does a great job describing the zombies. This book is not for the squeamish! Overall, it was a pretty good book! There are parts in this story that felt slow and clunky, though. Don’t get me wrong, it is a fun read, but I got lost in the filler. If I’m being honest, this book has too much padding. 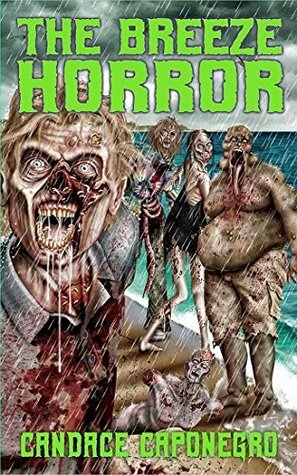 The Breeze Horror would make a great B-movie!